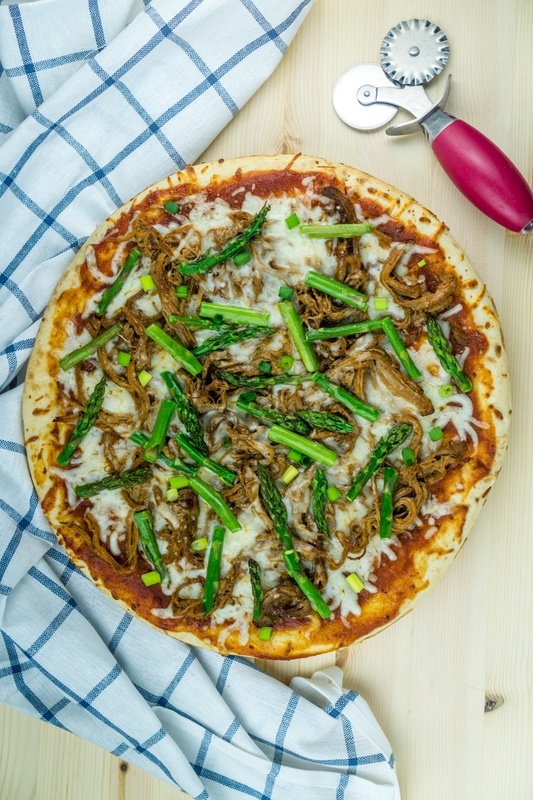 Use leftover pulled pork to make this BBQ Pulled Pork Pizza with Asparagus in just 20 minutes for a delicious dinner! Preheat oven to 425F. Spray a large non-stick pan with olive oil. Spread the pizza sauce over the pizza crust, add about half the mozzarella cheese. Top with BBQ pulled pork and the rest of the mozzarella. In a small bowl, spray the asparagus with olive oil and mix well. Top the pizza with asparagus and bake at 425F for 12-15 minutes. Top with chopped scallions and allow to cool for 5 minutes before serving.